Published: Aug. 10, 2010 at 03:55 p.m.
Seahawks WR Mike Williams, a former top-10 pick, is trying to get back in the league after a two-year absence. RENTON, Wash. -- All offseason I've heard stories of how good wide receiver Mike Williams has looked with the Seahawks while trying to finally make good on an NFL career he squandered away. Two years away from the game, and he's really made this type of impression? Was Seattle this desperate? Was coach Pete Carroll so gung-ho to give one of his former USC players a shot that the feel-good story spin was being pushed? These offseason stories of redemption often fill the void between the Super Bowl and training camp, so I didn't know if this was merely hype or if Williams was on track to be this season's Anthony Hargrove -- the defensive tackle who rebounded to play a huge role in the Saints' Super Bowl run after being suspended for the 2008 season due to multiple violations of the league's substance abuse policy. When I saw Williams last week, the stuff I heard about him being in shape was legit. He is still big for a wide receiver (6-foot-5, 235 pounds) but he is nothing near the JaMarcus Russell-like 270 pounds he weighed just before he was exiled from the NFL in 2007 for being a Russell-like bust. Williams, who hasn't played since being released by Tennessee, was intense on every play in practice and, if he's put in certain positions, like fade routes near the goal line, he's skilled and big enough to where the only person who could stop him is himself. To date, after three teams and three unforgettable seasons, the player drafted 10th overall by the Lions in 2005 has yet to win that battle. "I'm confident in myself and that's first," Williams said. "I put the time in. I put the effort in to get myself to where I want to be physically. I'm excited to get under the lights to show guys what I can do and who I am and change the perception of my name." That perception is pretty much one of waste. Detroit wasted a top-10 choice on him. Oakland wasted a fourth-round pick in trading for him. Tennessee wasted their time with him. He wasted so many peoples' dreams. For the past two seasons, he's wasted away, out of football, making calls that went unreturned. 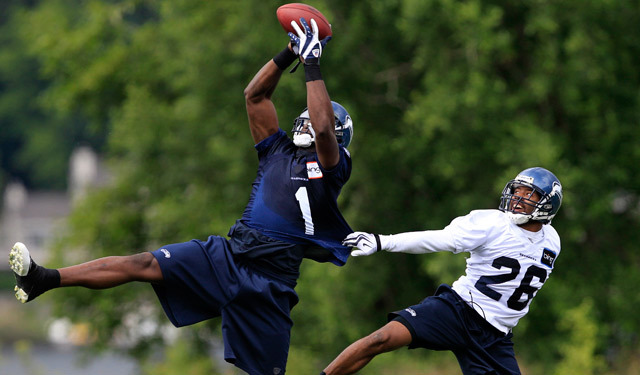 Carroll, after taking the job with the Seahawks last January, gave Williams a workout. Williams blew things out. First, by being in incredible shape and secondly, by performing like a guy who might be able to eclipse his career 44 catches in one season. "I'd love to, this time next year, put together a year like Cedric Benson did (last year). That's cool to me. It's unfortunate to be in that position... You just have to make the most of it. That's my mindset." "The one thing about perception, it's always new to different people," Williams said. "The people here in Seattle have read things and probably have their own thoughts. I'm able to control the facts like who I am and how I work. I am excited to go out there and play at a high level and do the things I've prepared to do and know I can do. I don't want to talk about it. Just go out there and prove it." That's been the most impressive thing about Williams. He hasn't talked his way into a roster spot. He worked his way into the rotation at this point of training camp. Unless he gets a bad case of the yips this preseason, he'll make the 53-man roster as the No. 4 receiver behind Deion Branch, T.J. Houshmandzadeh and Golden Tate. His size and speed make him far more valuable than the depth-chart slot, though. "He's probably the most pleasant surprise that we've had," quarterback Matt Hasselbeck said. "He's worked his tail off. Plus, he's something different. We're throwing 'Go' routes all the time. If a team gives us a one-on-one, we'll take it. We can throw you deep, back shoulder, change the route. If I see something, I'll signal to him or if we have a running play and I see something I'll throw a signal and, bam. He can be our Brandon Marshall." Whoa now. Hasselbeck might be carried away with the comparison in player, since Marshall's resume runs laps around Williams'. But the big, physical receiver role was the actual parallel he was trying to convey. With former Denver assistant Jeremy Bates now the offensive coordinator in Seattle, much of what the Seahawks do will be what the Broncos did when Marshall was there. So there is a role for a big wideout like Williams. Ironically, Williams might not have had this opportunity had the Seahawks made a harder push for Marshall, who they were tempted to sign to a restricted-free agent offer sheet, but Denver's asking price for compensation was too steep. Williams, for now, looks to be that option -- and if he happens to emerge, he could be yet another tale of a player who finally understood what it takes, albeit after not getting it right more than once. "I just think the guys here look at it as this is an opportunity, me personally to make your name good, to do the things you want to do in this league that you set as goals for yourself," Williams said. "For me, you either do it or you don't. I don't think there's any in-between. That's the attitude I have about it. I'd love to, this time next year, put together a year like (Bengals running back) Cedric Benson did (last year). That's cool to me. It's unfortunate to be in that position for whatever reason, but that's the position that you're in. You just have to make the most of it. That's my mindset." It's not uncommon to see a player rebound after missing a season due to injury. There are also cases of guys being suspended for a season due to off-field transgressions and getting another shot. Second chance a smart move? While Williams' exile wasn't the result of either, resurrecting or restarting a career after a year or more away from the game isn't impossible. Here are some examples of players who have done it or are in the process of attempting the feat. Anthony Hargrove, DT, New Orleans Saints: Years of substance abuse led to the veteran being suspended for the 2008 season. He had very few takers when he was reinstated, even after sending out videos of himself pleading for a tryout. The Saints gave him a chance last summer, moved him from defensive end to defensive tackle, and he flourished with 42 tackles and five sacks. He re-signed with the Saints this offseason and could have an expanded role, especially since he's off to a good training camp. Matt Jones, WR, Cincinnati Bengals: Jones led the Bengals with three receptions for 42 yards in their Hall of Fame game loss to the Cowboys on Sunday. He needed it because reports said Jones has not flashed much in his bid to get back into the NFL after being out of football last season. The 2005 first-round pick drew little interest in 2009 after being suspended for a drug arrest and later violating his probation. When Terrell Owens signed with Cincinnati just before training camp, Jones' chances of making the team as its No. 5 receiver got a little tougher. He needs to step up and/or hope that Antonio Bryant's comeback from knee problems shelve him for awhile to make this roster. Antonio Bryant, WR, Cincinnati Bengals: Bryant didn't play in the Hall of Fame game and hasn't been able to do much in training camp as he tries to bounce back from left knee problems (and cartilage surgery) that limited him to 13 games (39 catches for 600 yards, four touchdowns) last season with Tampa Bay. Concerns about Bryant's health, which have mounted since he signed a four-year, $28 million free-agent deal, are one of the main reasons the Bengals added Owens. The Bengals paid him so handsomely because of the production he gave the Buccaneers in 2008 (83 catches, 1,248 yards, seven touchdowns) after being out of football in 2007 because of a four-game suspension for a failed drug test and a poor history with getting along with coaches. If he is able to rebound, he could give Cincinnati a triple threat with Owens and Chad Ochocinco. If not, he might be back to asking for a chance again in 2011. Michael Vick, QB, Philadelphia Eagles: Vick is firmly entrenched as the No. 2 quarterback behind Kevin Kolb. For the second straight season, Vick will be used in gimmick-type/Wildcat roles. He should get a lot of action in the preseason, which, depending how he plays, could be his best hope to draw enough interest to compete for a starting role with another team in 2011 (his contract expires after the season). More importantly, Vick has to prove himself, once again, off the field. Vick was exonerated by the law and NFL Commissioner Roger Goodell when a longtime friend was shot at a public birthday bash in Virginia this summer. However, the incident did nothing to quell skepticism of his judgment, which already was in question following a nearly two-year stint in prison on dogfighting charges. Vick has kept quiet and reportedly looked fine in training camp workouts, so he appears to be trying to stay on course.